Author(s) / Editor: An Interview with Joe Seme, Manager, Semtorq Inc., Ohio, USA Interviews and Edited by Professor Paul G. Ranky, PhD, NJIT, USA. Description: Level: Robot welding cell design engineers, factory operations managers, quality control engineers, industrial and manufacturing systems engineers, visual factory designers, associates / operators, workforce productivity improvement managers, students & faculty, interested in eliminating unnecessary waste, lost time, and workers' compensation costs by improving factories, and literally any business by means of Visual Factory Management & Control (VFM) methods and technologies. Also excellent for undergraduate / graduate education and research. Industrial Sponsors/ Contributors include with special thanks to Semtorq Inc., USA, Rockwell Automation, Inc., USA, CIMware Ltd. UK, CIMware USA, Inc., and others. 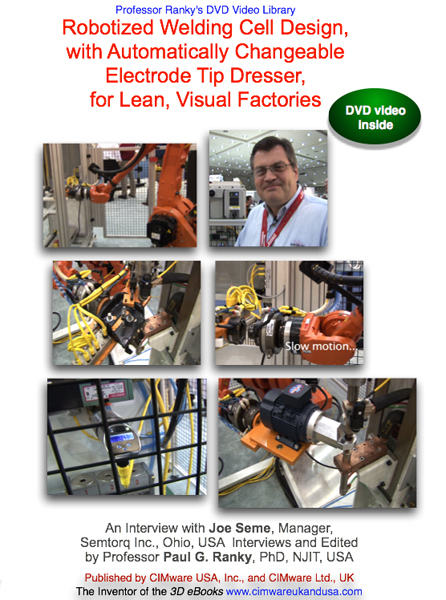 Contents: This publication is a professional quality DVD video covering robotized welding cell design and operation control topics in lean, Visual Factory Management & Control (VFM) environments. VFM is an integrated set of methods and technologies for the purpose of reducing waste at all levels, improving profitability, increasing lean production control, product & process quality, productivity, safety, on-demand / just-in-time (JIT) production / delivery, and employee morale in a factory, or virtually in any business. The key to the success of VFM is the expert implementation of 'visual controls', making information truly visible and clear for everyone. System Requirements: DVD-ROM: NTSC standard definition (SD) DVD video player for TV, or computer. Approximate length 16 minutes, in 16:9 widescreen format, also playable on a 4:3 regular screen, or any good computer screen (800 x 600 resolution, or better). Furthermore available in PAL DVD video, in streamed digital, and Apple Video iPod formats. The HD (high-definition NTSC and PAL) formats are also available as soon as the HD DVD standard is finalized and players are available. Please visit on the web www.cimwareukandusa.com for available formats, and further relating titles & products. Sample video clip in low-res.